Hub's Photography Tips & Picks: Camera Tip - Does your camera need glasses? Camera Tip - Does your camera need glasses? Probably not. But your camera may need adjusting to "see" as you "see". Unfortunately, not everyone has 20/20 vision. As a matter of fact, most eyes have their own unique focusing characteristics. If your DSLR isn't adjusted to the focusing capability of your eyes, less than sharp images will likely result. 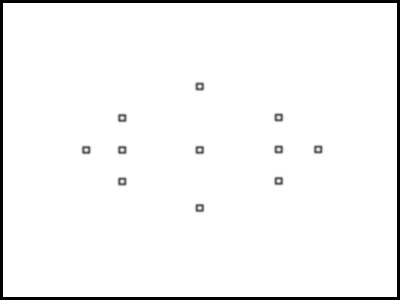 For regular eyeglass wearers or those requiring reading glasses, you already know that there is probably a difference between your eyes and standard factory viewfinder settings. This eye-versus-camera vision discrepancy even comes into play when you rely on autofocus mode. There is a simple solution built in to most DSLRs -- a solution and adjustment that should be checked frequently. 1. Find a large piece of plain cardboard. Any light color will do. OR find a well-lit blank wall. 2. Turn OFF your camera's autofocus. Use manual focus. Set the lens focusing ring to infinity. We want the lens to be WAY out of focus. 3. Point your camera's lens at the cardboard or blank wall. Get close enough to the cardboard or wall to completely fill your viewfinder. Don't focus on the cardboard. Leave the focus set at infinity. Shown above are the boxes I saw through my viewfinder as I started my diopter adjustment. Notice that the boxes are soft or out of focus. 5. Turn the camera's diopter adjustment in either direction until the boxes become very sharp (in focus). If the boxes become even more out of focus, turn the knob in the opposite direction. Eventually you will find a knob position where the boxes are sharp. Turning the diopter adjustment brings the target boxes into focus. 6. That's it! Your camera's viewfinder is now customized to your eye. Once the boxes are sharp, your viewfinder is adjusted to your specific vision. I suggest you check this adjustment occasionally because it is possible for the diopter control knob to be accidentally moved during normal camera handling. Since the process only takes seconds and can be done anywhere, it's well worth the time invested. This adjustment has NO impact on the automatic focusing feature of your camera which will continue to work as before. The danger in not adjusting the viewfinder to your vision is that you may think the autofocus mechanism has incorrectly focused your camera causing you to incorrectly override the suggested focus setting. Or the camera may have selected the wrong object as its focus point, and you may not be able to "see" this inaccuracy and make the necessary correction. 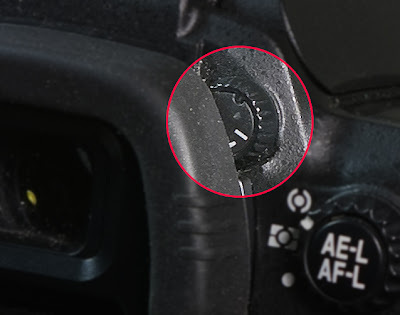 Even if you have perfect vision, there is always the chance that the diopter control knob has moved during normal camera use (e.g., while taking the camera in and out of the camera bag, while changing other camera dial settings, etc.) It's best to synchronize all these visual picture taking components -- your eye, the camera's viewfinder and the autofocus system. And you do this with the diopter adjustment control knob. On occasion, I have wanted to check my diopter setting in the field. Since I don't normally carry a large cardboard or blank wall into the field, I substitute the sky. This works very well. If you have questions or comments, just let me know.